I have a new flatmate. It is a spider. He decided to move in at the weekend, probably because it is so chilly outside now. I am already having problems with my new flatmate. I wasted so much time yesterday. I wanted to wash my dishes when I found my new flatmate running around the kitchen sink as if he was in training for the 1500 metres at the Olympics. 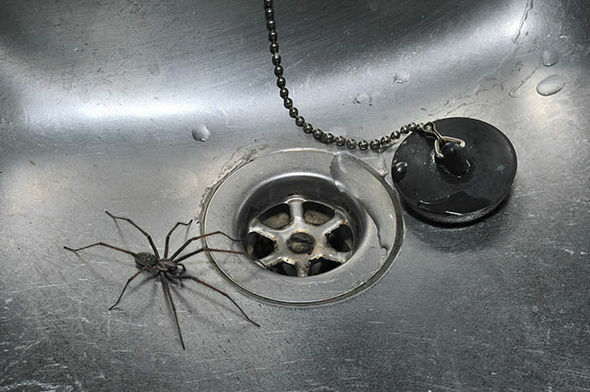 So as a kind hearted and considerate fellow resident of the little nest I did what I have always been told is a helpful service to render a spider in the sink. I made a pathway of kitchen paper so that the spider could escape. Did he take the hint? Nope! Well, after waiting patiently for fifteen minutes I decided I needed to crack on with washing my dishes. So I scooped him up inside my hand (no, I am not freaked out by creepy-crawlies) and decided that since it was a fine day, he ought to have some fresh air out in the little courtyard outside my front door. Soooooo uncooperative – let me tell you! He wanted to abseil from my hand and then took off inside the innards of my electric toaster. Well…the possibility of electrocuting my flatmate or finding him welded to my cheese and chive bagel deeply concerned me. So I spent another fifteen minutes or so trying to dislodge him from the innards of my electric toaster. Crumbs! Literally everywhere. I have been finding them in my hair all evening. When he finally gave up his hiding place and made an appearance he decided he would crawl right up my arm…I tried to obstruct him but having eight long lanky legs makes him pretty fast. What I am trying to say is…I am finding it really hard to get along with my new flatmate. This is supposed to be my haven of rest and calm. My new flatmate is disturbing my peace and tranquillity. I am going to have to sit down with him over a cup of tea and remind him of the terms and if he won’t agree to them, I am going to suggest he move out and find a new hidey-hole to spin his web in. I hope it won’t come to that, because truth be told, I love spiders and am fascinated by their web – anyone interested in the marvels of nature has to respect spider’s web! Make the spider your friend… no terms then.. I don’t want him jogging in the kitchen sink…I need to use it too frequently. He can jog round the bath tub if he likes, I use the walk-in shower most days. Also the toaster is off-limits to him. We can be friends if he will respect those terms. well, Terms are always subjected to risks.. Hope you both will sort it out.. Thank you…he was waiting for me on the sofa when I arrived home! I can’t believe you picked the spider up!!!! I did indeed! I have no fear of spiders or any other eight legged creatures. I won’t touch a dead spider though! I am in awe of you!! I can’t touch spiders dead or alive (unless they are the small money spiders!)! I trust spiders in England…there were so many when I lived in the countryside…and mice. I would be hesitant to touch a spider in a lot of other countries! That’s very true! There’s just something about them – particularly the large ones that you get indoors sometimes, urgh, those ones make me run a mile!! When I think of spiders I just see cobwebs to be cleaned. Swept from the ceiling with a brush. Spiders have no place in our house. They can find their own environment to flourish……and my wife gets agitated whenever she sees one. I am all for clearing away cobwebs. I don’t want cobwebs in the house. But outside covered in dew i think they are incredible. I just don’t like to hurt any thing, spiders or any other little creature. I would rather shoo them outside. But this spider is determined to live inside. I respect their web building abilities, but I do NOT wish to share any space at all with them. If they build outside – fine. I’ll spray them or have them sprayed though – where there’s one… But if they come indoors? I become homicidal. They die. With lots of screaming and Ewwwwww s on my part in the process. I’ve learnt to pour bleach down my drains, discouraging them from crawling OUT. Brrrr. If I’d seen that? Spidey would have died a watery death (and yeah I know they can swim, but he/she’d have been swirling down the drain in a deluge of water. Then the stopper would have been firmly shoved into place. Bless you for being kind to the spider. They need all the friends they can get. I Was reading my guidebook of Scandinavia (You’ll find out why later) in bed yesterday when all of a sudden a spider dropped out and landed on me. The neighbours probably thought I was being murdered in my bed from my reaction! Spiders have a habit of jumping out on people…it’s their prankster sense of humour I am sure. My niece does the same thing…she is almost 18 months old and she likes to surprise people already! I saw a little bit in one of your comments on someone else’s site what your plans are and I am very jealous! Good good…look forward to seeing your pics! I love spiders too, but they’re so independent, I usually end up moving them. This spider keeps coming back! I don’t now what is going on with him, but he sat next to me on the sofa last night when I was typing. I am starting to worry he might be lonely and friendless because he isn’t behaving like a typical spider. We used to go to work with Dad (window cleaning) from a very young age. We used to run ahead of him and rescue the spiders so he didn’t have to kill them when he washed the windows! …and I have even scooped wasps into my hands (normally with a bit of jam or syrup to keep them happy) and released them outside in the fresh air. This was a hilarious post. Made my morning. And from the comment section, I see that he is determined to stay. You should name him by now. My concern is…he seems to think it is alright to bring home some of his friends. I am not sure I can cope with a whole gang of spiders! Ha! I was gonna ask you if you were sure that the one from the sink was the same one on the couch, but I didn’t want to freak you out. He seems like a rebel, so I wouldn’t be surprised if in the end YOU had to move, because they overtook the whole house. I don’t want to ever have to resort to the DustBuster to resolve any issues! Do a roommate agreement. Have it signed and notarized.